Many summer camp participants are engaged in education, from university lecturers to workshop leaders at youth centers. As the practice of eTextiles combines knowledge from various disciplines, teaching eTextiles requires educators to cover various topics, such as textile techniques, electronics, programming.. and so on. Is there an ultimate toolkit for teaching eTextiles? What are the topics that need to be taught? How do you explain them to novices? When teaching eTextiles from beginning to the end, what are the topics to cover, and in which order you would teach? What kinds of hands-on activity do you introduce? Often teaching eTextiles involves teaching basic programming and electronics to novices. How do you explain “variables”, “array”, “function”, “ohm’s law” when teaching programming and electronics? Could there be an ultimate dictionary for the teachers listing which metaphor to use? many of us come to E-Textiles from different disciplines. From textile design, various craft disciplines, material science, electrical engineering, programming – what would toolkits tailored to individuals with existing skill-sets look like? I would love to join this group! I was umming and arring as all the groups sound *so* fascinating, but my heart and mind are very much in education and learning, and I’m excited to work with a focused group in this. I’ve been working in education for 10 years in a freelance “visiting artist / designer” role, and I interpret what I do in schools and communities very much part of my practice. The subtopics look really interesting, and I’d like to add another idea for a discussion topic: networks -I find I spend so much time working on content, I share via google docs and my blog but interested in discussing practices for easier creating / sharing / communicating curriculum and content for teaching. I am also really interested in the storytelling (i.e. context / content for design and making process) and would like to share ideas on this. This is my jam :o) I have worked in learning design for the past seven years, with my work focusing predominantly on teaching the design process and basic computational concepts through eTextiles and hybrid crafts. I am fascinated by exploring new methodologies for learning that unite the physical and the digital, especially activities that incorporate embodied learning. I have recently been prototyping activities for my workshops and classes that pull exercises from game design into this space. Also super passionate about equity and designing ways in which these tools promote access for all types of learners. I have grappled with questions around the subtopics for while and look forward to hearing new perspectives. Becca, +1 on all of your subtopics as well Another area of interest for me is how to design pathways that transform learners into teachers. I’ll be happy to join this group as I’m working a lot to try to spread the word about wearables and DIY here in Italy and I can share some experience I developed during last years. I’m looking forward to learn about your experiments and knowledge about it. Highly likely that a few educational projects are flying my way very soon – one perhaps in Senegal (fingers crossed for that one). So I think it would be a lot of fun to think of kits – and dance some algorithms?? Eep! Great focus groups all around. I am also highly interested in “sustainability” and “expert tools” and “make your tech and wear it too”. However, this group for me resonates since I have out a lot of thought into how to design tools for teaching. I would love to go further with building tools and a kit that is not only educational, but solves some problems along the way. As of now, in the classroom I take tools from the fashion world and tools from the electronics/DIY world. Sometimes they don’t connect easily or integrate that well. I also love the thought of how to “… design pathways that transform learners into teachers” as Liza put it. Really being able to empower someone with knowledge that they feel they can show or unpack for others. Yay! Yes, its difficult to choose with in all this interesting topic. But as I teach since 3 years, I would like to join the Educational Toolkit group. 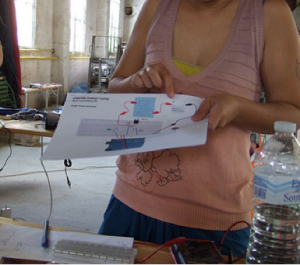 As an artist working with e-textiles, soft electronics I jumped quite blank into the field of education. I tried different things, different methods and formats. Some of them were successful, some not. Especially because the knowledge students have to gaffer to make a workable prototype in our fileld is quite big. I also struggle how to teach electronics, bits of programming in combination of autonomous art. How can this structured learning behavior linked to a more intuitive experiment learning? I did some tryouts during an end semester module workshop which I like to explore more. I’m exhibited to share, hear and learn more of the knowledge of teaching e-textiles, soft electronics. I’ve joined this group as I think it makes sense with my work and research focuses I was in the knitting group initially but am hoping I can still observe from afar. Over the last year I’ve been working more and more with quite specific user groups – people who are blind, visually impaired or deafblind and also some who have quite specific learning needs. I’m going to be carrying on this work further from October through a PhD, specifically in designing and creating eTextile tools for interaction to be used by blind and visually impaired people and a lot of this will involve workshops in which the participants will make their own pieces to interact with. Soooo, I guess I’m interested in how you cater eTextiles for quite specific user groups and bring them into the process of designing tools for others.